Have you ever been a part of a good church? How about a great one? Still even better, have you been on a run when you experienced a unique anointing from God? I know when you begin to differentiate between good, great, and anointed you can get on sketchy ground when it comes to churches. Nevertheless, I have definitely experienced some leadership intangibles that are rather consistent, and I would like to pass them on to you. A good church is steady and consistent. A great church is in the midst of an exponential return. An anointed church is experiencing something supernatural that can only being explained by the divine interruption of God. 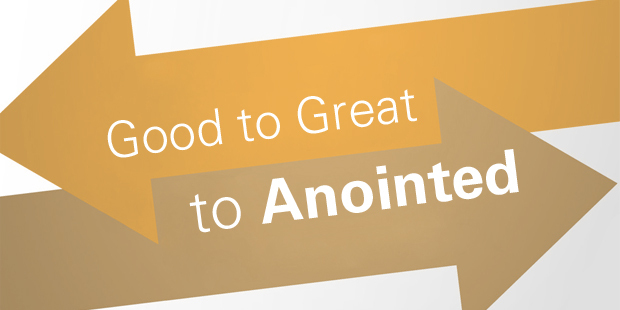 While I have no science to offer, I have intuitively noticed some leadership habits in churches that are enjoying a good ministry as a base, are on a great journey, and in a period of anointing. While I don’t think you can formulate a unique movement of God, I would like to encourage you with a few leadership patterns I have found repeatedly. I hope they spur you to chase the person of Christ and not the form of an above average institution. 1. A deep commitment on the staff to personal holiness and the priority of family. 2. A strong conviction and reliance on the authority of Scripture over life. 3. A personal calling to that specific location. 5. A humility and flexibility to do whatever it takes even if that means dramatic change. 6. A willingness to fail. 7. A demonstrated passion for personal evangelism and life change. 8. A leaning towards bold faith decisions. 9. A powerfully clear and unique vision. 10. A surrender to pursue only the glory of God not the acclaim of others. I want this to encourage you as a leader to follow God with all your heart. Exponential results may not be seen in dramatic numeric growth. We are called to be faithful to the one who called us. Surrender anew today to your God, staff, people, and city. I would be remiss if I didn’t tell you that these churches also exhibit average preaching, common music, dated ministries, and disorganized leadership. The special sauce isn’t always what you think. >> Read more by Todd.